The imagery of soaring eagles has inspired mankind for generations. 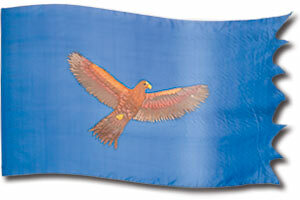 This banner portrays an eagle soaring across a pale blue sky. Its light brown and pink plumage represents the lightless of being carried up and away in an act of redemption, a metaphor described in Exodus 19:4. The eagle actually appears to soar, circling over the worshippers' heads. The hovering, protective aspect is highlighted in this banner. The characteristics of this birds are frequently referred to in the Bible: its swiftness (Job 39: 28, 29; 2 Samuel 1:23), its building in high cliffs (Jeremiah 49:16), its powerful sight (Job 39; Deuteronomy 32:11), its great powers of flight (Proverbs 30:19) and its teaching its young to fly (Deuteronomy 32:11). God's powerful redemption is likened to being lifted on the wings of an eagle in Exodus 19:4 and His caring protection is described as an eagle hovering over her young in Deuteronomy 32:11. Gods ability and strength to support us is beautifully portrayed as being lifted on the wings of an eagle in Isaiah 40:31. Even thought the eagle is a majestic bird, God is the King over eagles. Job 39:27. His judgment is likened to an eagle swooping on its prey. It is swift, sudden and sure. Jeremiah 48:40, 49:22, Hosea 8:1. Pale Blue: Healing, Holy Spirit, Spiritual or Heavenly Realm (Exodus 24:10; 28:31; 39:22; Numbers 4:6; 15:38; 2 Chronicles 2:7; 3:14; Ezra 1:26; 10:1; John 14:26). Brown: Cannot get to God by our own means. Pink: Healing Body, Soul and Spirit; Comfort; Praise Brings Health; He Makes Our Heart Flesh, Keeping Our Heart Soft for God to Work On. White: Holiness of God, Cleansing, Light, Sanctification, Righteousness, Purity, Christ, Angels, Saints (Ecclesiastes 9:8; Daniel 7:9; Isaiah 1:18; Matthew 17:2;28:3; Acts 1:10; Revelation 3:4,5;18, 4:4; 6:2; 7:9; 15:6; 19:8).